Transport for London (TfL) has just launched a consultation on the final proposals to introduce a Direct Vision Standard and Safety Permit for Heavy Goods Vehicles (HGVs) over 12 tonnes following two previous phases of consultation in 2017 and 2018. TfL is now seeking your views on these proposals with a particular focus on the Permit application processes. This includes the process of obtaining a Direct Vision Standard (DVS) vehicle star rating, the safe system requirements, the permit application and administration process and the enforcement and appeals process. The proposed scheme would require all HGVs over 12 tonnes to hold a Safety Permit to enter or operate in Greater London. Operators will be able to apply for permits from October 2019. As part of the DVS, HGVs will be rated between zero-star (lowest) and five-star (highest). 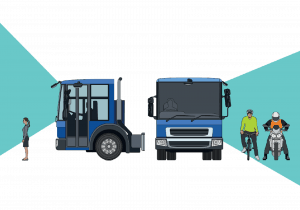 From October 2020, zero-star HGVs would be banned unless they can demonstrate they operate in compliance with other mitigating measures in a defined safe system to minimise their risk to vulnerable road users. By 2024, zero, one and two star HGVs would be banned unless they can demonstrate compliance with an updated progressive safe system. The consultation opened on Tuesday 8 January and will close on Monday 18 February. You can write to TfL at Freepost TfL Consultations or by email to [email protected].